But, how do you help a child that becomes a prisoner of his/her bad habits? Preaching isn't the solution, although it is the obvious route that parents select. Wouldn't you just wish for a world in which you tell your child to stop talking with their mouth full ... and they do it! Or you beg your child to stop sucking their thumbs ... and they magically fulfill your wish! Bad habits range from the "not-so-helpful" ones to those habits that are painful and can be damaging in the long term. After knocking my head against the wall trying to figure out how to help my kids one day when the first bad habits emerge ... I hit the nail on the head. 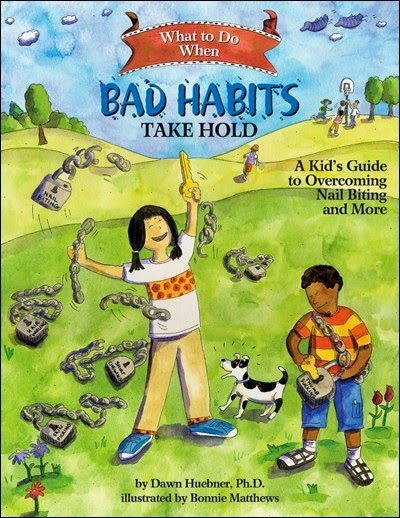 I was browsing books online when I came across a book with a title that immediately caught my eye - What to do When Bad Habits Take Hold - A Kid's Guide to Overcoming Nail Biting and More. OK, OK, I admit, there are probably hundreds of apparently similar "self-help" books or books with recipes for resolving problems. Or "What do Successful Kids do"
So I completely understand that you may think that this one is probably just another dud. I may have had my suspicions too. But then I looked at the back cover. Hey, the book was published by the American Psychological Association (APA). It was the Real McCoy! This was a perfect non-didactic book for children to gain insight into their bad habits, written by professionals. Crucially, this book explains easily and breezily that your child is not alone. In fact, my twins learned that lots of kids have habits they wish to lose. What To Do When Bad Habits Take Hold explains how habits are learned behaviors and that they have some importance for us. They are 'useful' even if a child does not make a conscious decision to repeat them. However, habits can lock a child in a tight repetitive embrace, making it seemingly impossible to escape. The habit locks a child in, so the child needs keys to free itself. And that's exactly what this book offers. It offers a set of keys to children to free themselves from harmful habits and what I especially love about it - is that it can be read aloud to your child and its advice can be followed interactively. 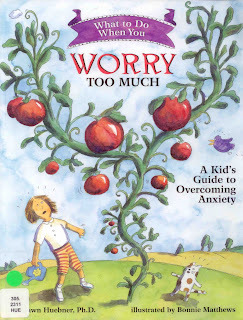 Moreover, this is just one of a handful of self-help books for kids published by the APA in its What-to-do Guides for Kids book series. This series includes books on many delicate topics such as how to overcome problems with sleep, how to stop grumbling and focusing on negativity, how to overcome anxiety, how to overcome OCD and how to master anger issues. Dawn Huebner (Ph.D), the book's author, does a wonderful job of explaining to children how every single bad habit has a useful side. It may help the child concentrate, or help keep ones hands busy or briefly soothes someone's sore spots. But as they help kids in one way, they also slowly get locked into place and even if a child now wants to get rid of a bad habit, it no longer can as the habit is here to stay. Unless - the child has the right keys to open the locks. Huebner fortunately offers, not one, but five keys that can help any child to unlock itself from the chains of a bad habit - regardless of which bad habit it is. One way of getting rid of a bad habit is to do something that gets in the habit's way. Namely, if you want to bite your fingernails, for example, you can put a band-aid over the tips of a finger or several of them. This will prevent you from resorting to your old 'bad' ways. This key works by giving your body - or the part of the body that you habit is linked to - a "workout". So, if you have a mouth-related habit like chewing on your hair, you could try new motions such as slurping spaghetti, chewing raisins, chewing bubblegum, biting on rubber toys... you name it. We usually accumulate tension during the day and like a balloon our feelings keep accumulating - until our "balloon" can burst. So it is important to keep releasing tension during the day, instead of waiting for the "balloon" of our feelings to pop. Many ways exist to release this tension - including activities that prompt us to laugh, talk, sing, run... all of which can drain the tension from our bodies. The options are endless - from rollerblading to doing yoga, from swinging to jumping rope, from drawing to petting a dog. 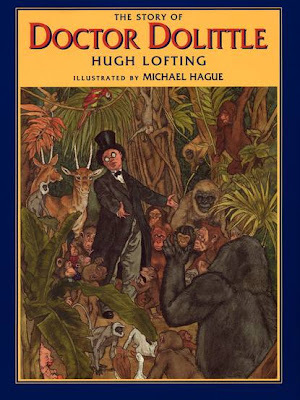 And, lest I forget, this is an excellent read aloud book - as it allows you to share information about the problem with your child, but also helps you to give ideas about the best way to kick the bad habits! To be read and enjoyed aloud and together. OK, the keys are presented very nicely and there are many details and practical tips about how to implement them and get rid of the bad habits. But there is something else, something deeper that I like about this book. It is a book that enables a young person to see they can overcome challenges that may initially seem unsolvable. Young people are often unable to view how much power they really have over life and how a little targeted effort that is repeated every day - can lead to big results. But - this book is not only for children. By using the tactics recommended by the book - especially Key# 2 (The Fiddle Key), Read Aloud Dad managed to stop nail biting in his late thirties! Yes, I am ashamed to admit that I used to bite my fingernails for the best part of my life. But it was easy to stop. I just bought 3 packs of 100-mint orange-flavored Tictacs and every time I caught myself bringing a finger close to my mouth - I took out a mint and popped it into my mouth. After roughly 4-5 days of the same tactics, I stopped biting my fingernails forever. This happened around 5 years ago.